Fits as expected and the fabric is EVERYTHING!!! 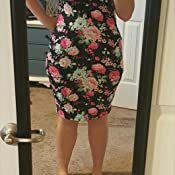 I'm about 155, 5'2.5", and I have a fupa but this dress fits great and makes me feel so confident. i am 5'1 120lbs I got xs/s and fits perfect! TAM WARE starts its online business with a love of design and a unique range of clothing for Men, Women, kids and babies. This is your one-stop online shop committed in offering top-of-the-line fashion merchandise with distinct combination. Play mix and match with choices from casual everyday wear to trend-setting evening wear, there’s something to suit your taste and personality. We design, manufacture and directly distribute every item in our collection. With a great selection of styles at everyday prices, we want to provide buyers with good quality products. We aim to make shopping fun and convenient from the comfort of your office or home. 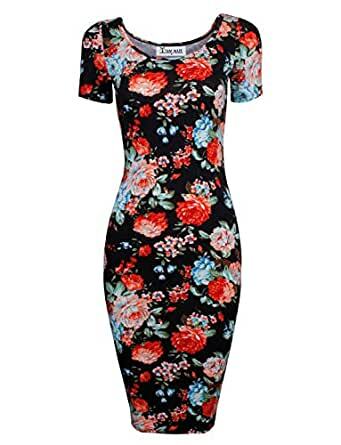 Add this floral print one to your collection from TAM WARE Brand. More than 25 colors are available for you to collect for your different events. It is the perfect style piece for work or play, this TAM Ware dress is a wardrobe staple! Made of Cotton, Rayon and Spandex with high quality sewing techniques. You can feel the cool and soft to the touch cotton jersey material. ​Its simplicity allows you to look classy and fashion forward. It is the perfect day-to-night outfit. Pair it with some flat shoes to go shopping and just change into some heels and add accessories for your date night. It is a wardrobe essential! Its sophisticated design will show off the fashionista that you are. 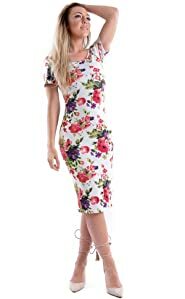 This Classy trendy midi dress enhances fabulous body figure. This color is the color of love, passion, desire, heat, sensitivity and romance. This color that sophisticated design will show off the fashionista that you are. 5.0 out of 5 stars"Like a glove"
Just got this dress today and I love it! Fits like a glove and the print helps hide any "imperfections" that are real or imagined. Lol If it helps I am 5'5 and 205 lbs. I normally wear a 14 in a dress. I ordered the XL. I am a pear shape and this fit both my top and bottom well which is somewhat hard to find as you other "pears" know. 5.0 out of 5 starsNice!! I'm 5'9", 34C, 32" waist and 40" hips. Got a med-large and it fits perfectly! Love Love Love this dress got so many compliments wearing it for a special event. Will definitely be buying the other floral designs soon. 5.0 out of 5 stars... can say is that it may me feel very pretty. All I can say is that it may me feel very pretty. This is a very nice dress. I wore it to a wedding and loved it! 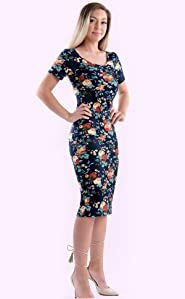 I am 5'6 145lbs and ordered a S/M. I was worried that it'd be too tight because everyone was saying order a size up, and i got a lil junk in the trunk. Good buy I would say! This dress is so pretty on and gives a great curvy look. Thick material. Long. We used this as our salon uniforms. Some girls had the dress altered to be a bit shorter.